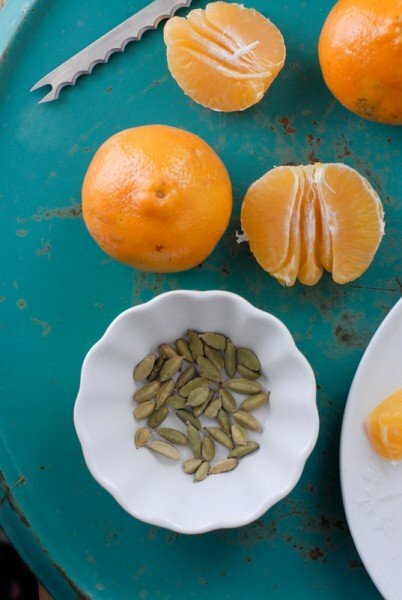 DIY Tangelo-Cardamom Vodka & a Valentine's Cocktail! 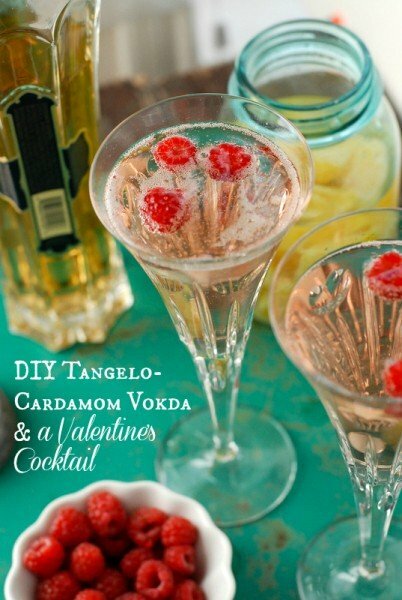 Home » Cocktails » DIY Tangelo-Cardamom Vodka & a Valentine’s Cocktail! I love celebrating the flavors of the season both in their natural form but in ways that keeps them around a bit longer too. 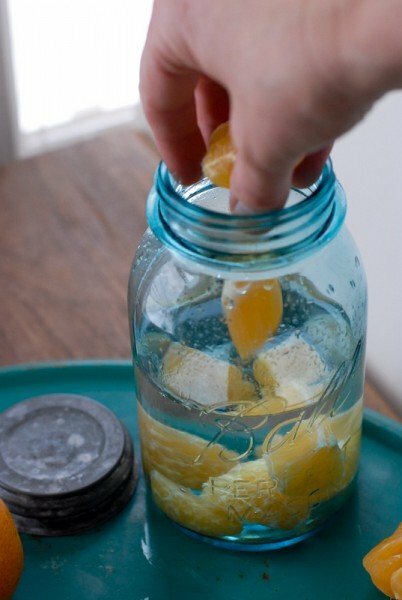 I personally love experimenting with infusing in liquor because it does not expire quickly. 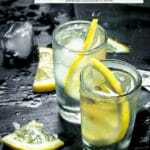 I often use vodka, which has been cultivated to be neutral in flavor and color in most cases. It’s perfect to absorb and showcase the essence of fruit, herbs and vegetables. My home pantry tells the tale of my madcap antics in the form of abundant Mason jars in various stages of creation! It’s citrus season and though that is not a Colorado crop we are fortunate to have Snowbird relations who flee to warmer winter regions and share the bounty by shipping us boxes of fresh orchard fruit. An accidental snafu on a recent order left us with triple the usual gift and an avalanche of fruit desperate for quick eating. Not knowing a small colony of scurvy victims I was forced to put on my creative culinary hat to start several projects simultaneously to save the uber ripe tangelos and grapefruit. 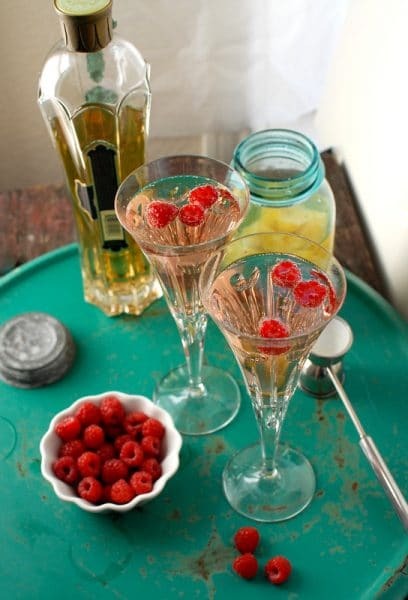 My mind is all about Valentine’s Day right now and a light, fresh, seasonal infusion seemed fun. Three of the five tiers in the gargantuan delivery box were of tangelos, as large as a newborn baby’s head I might add. Their tender, sunset-hued flesh was bursting with delicate perfumed juice turning a room instantly to an ode to springtime with the first rip of peel. I realized a meager jar of Tangelo-Cardamom Vodka was not going to make a huge dent, or a dent at all, but I was inspired so two tangelos were contributed for the cause. When infusing liquor I always consider the flavors involved to come up with a winning combination. 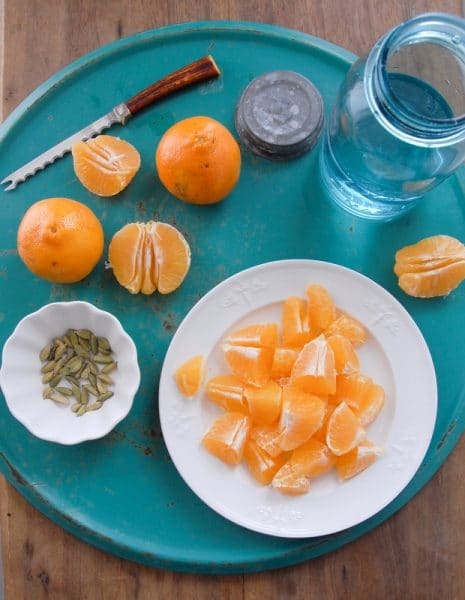 In this case the tangelo was very lightly flavored and sweet with the chance to be overwhelmed by stronger liquor or heavy botanicals in something like gin. I also did not want to risk the potential bitterness of the peel or pith so removed that before infusing. Pairing with vodka was the right choice and the result was a light elixir, simple and lovely; perfect for Valentine’s Day. 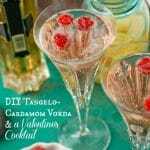 Tangelo-Cardamom Vodka & a Valentine’s Cocktail! 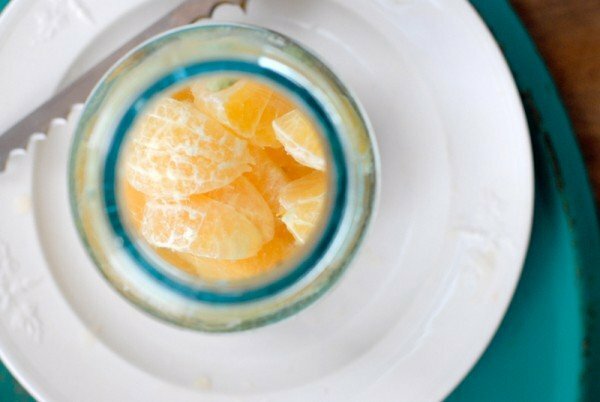 A simple, seasonal vodka infusion of Tangelo and Cardamom pods renders a unique, refreshing vodka perfectly paired with many mixers. 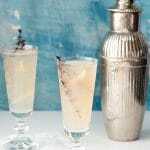 The Valentine's Cocktail is a very light, refreshing cocktail with a hint of sweetness, the freshness of citrus and the joy a bubbly cocktail brings! Allow to sit for 5 days. Taste. If the flavor is strong enough for your liking, pour liquid through a strainer pressing on the tangelo with a wooden spoon to extract all the juice and liquid but restraining the peel and membrane from the final product. If wishing to have a stronger flavor, allow to sit longer, tasting daily until the desired result is achieved. 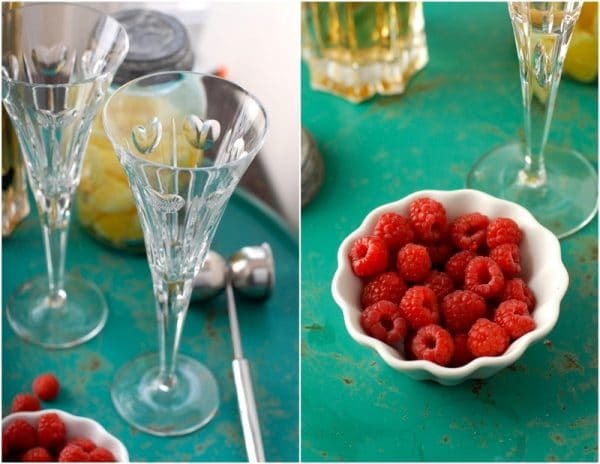 Place a few raspberries in the bottom of a champagne flute. 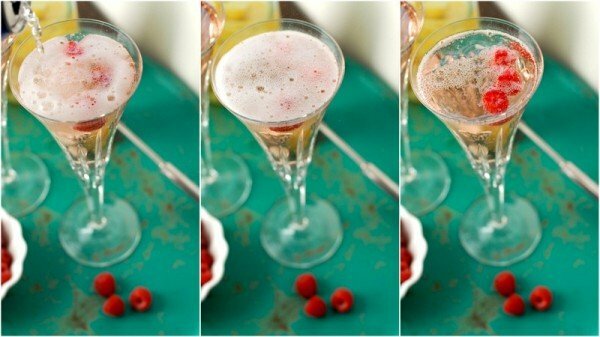 Combine the vodka and St. Germain in champagne flute. 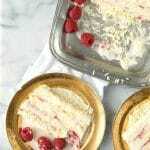 Top with sparkling raspberry soda. *I always recommend tasting what you will be infusing. I’d suggest buying an extra tangelo to gauge how full its flavor is. 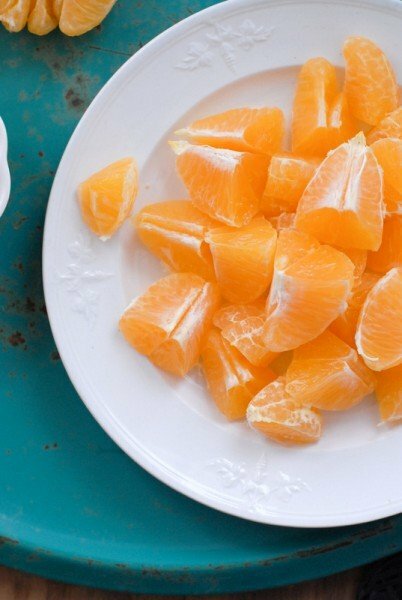 I’m sure you’ve encountered desiccated fruit with barely any juice and even less flavor. 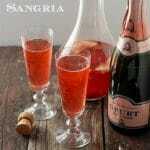 This infusion is best with juicy, distinctly flavorful fruit. What a happy accident! I wish my relatives in south Texas and Arizona would some some of this citrus love my way! Great use of the surplus. Lovely cocktail – looks great and it certainly sounds tasty. I should start infusing vodka – I love flavored vodkas but find the regular stuff to be rather uninteresting (because it lacks flavor). Anyway, great pictures and wonderful post – thanks. I adore anything citrus, cardamom and St. Germain so it seems you’ve created this cocktail with me in mind. If not, please don’t tell me. I love how delicately colored the final drink is. Definitely Valentine’s worthy. It’s really light and fresh Dulcie. Something delicate and slightly pink at this cold, dry time of year struck my fancy! Toni, this looks and sounds delicious! Is it too early to have one? (Yes, it’s been that kind of week!) My in-laws (in NY) have close friends who send them amazing citrus from Texas and Florida. I think I need to cultivate my own Snowbird relationships…and get some winter fruits sent to Colorado. Stat. The citrus we get is from an orchard near Naples Florida. It’s always incredibly flavorful and juicy. Love it when the box shows up though the triple order accident put a bit of consumption pressure on this round! Sounds delicious! 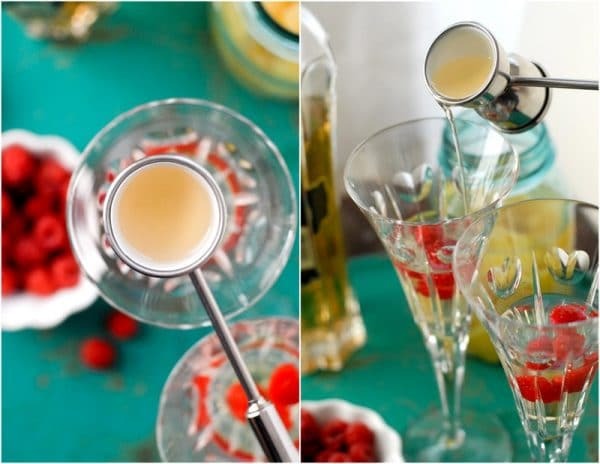 Must try this infusion and the cocktail sounds lovely – I enjoy St. Germain in mixed cocktails. We are about 3/4 of the way done with homemade limoncello – still needs some tweaking as right now it’ll knock your socks off! I have never made Limoncello Meeling; you’ll have to ‘report back’ on the end result! I find myself loving quick infusions like this one. The St. Germain works well because it is not a strongly flavored infusion; more like a ‘flirtation with spring’! Adding other light mixers keeps it refreshing and fun!